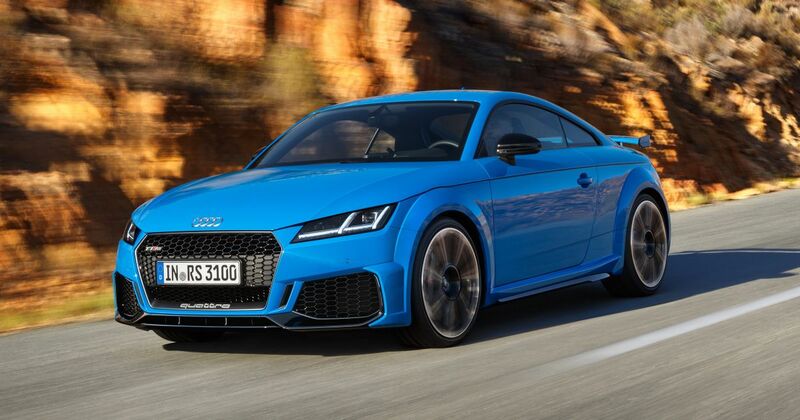 Following an update of the Audi TT last year, we now have a tweaked version of the mighty range-topping RS model to investigate. In terms of powertrain and chassis, nothing has changed. But let’s be honest, it wasn’t ever wanting for straight-line performance or sheer all-weather ability, was it? The 395bhp inline-five is still there, and still with its warble-tastic 1-2-4-5-3 firing order. As before, it works together with a Haldex clutch-based four-wheel drive system to deliver a slightly ridiculous 0-62mph time of 3.7 seconds. 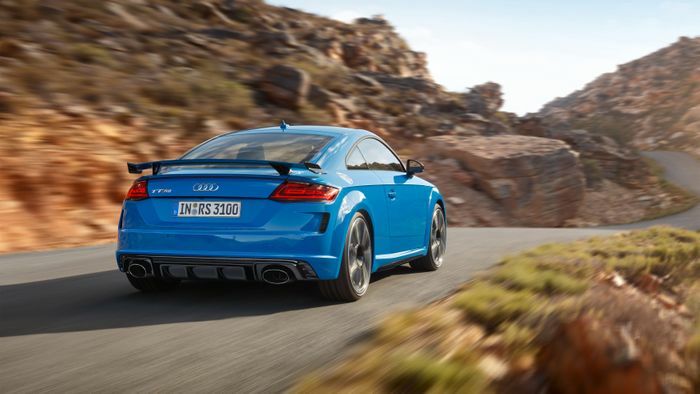 The top speed is electronically-pegged at 155mph, with a 174mph limit on the options menu. Conventional steel dampers are fitted as standard, but if you want, an adaptive suspension setup is available. It’s all pretty familiar inside, too. We have some lovely quilted leather sports seats, an R8-style steering wheel with integrated starter and drive mode buttons and Audi’s virtual cockpit system. So far, so familiar, but when we move on to the styling, there are plenty of tweaks to talk about. The massive Singleframe grille, for instance, is now flanked by larger air intakes, each of which has a new divider blade. The side skirts are new, as is the fixed rear wing, which has been given some purposeful-looking winglets. Under that wing, you’ll see a pair of new vents either side of the car, and lower still a redesigned diffuser. If you want to tweak the styling further, you can choose either a matte aluminium or gloss black styling package. 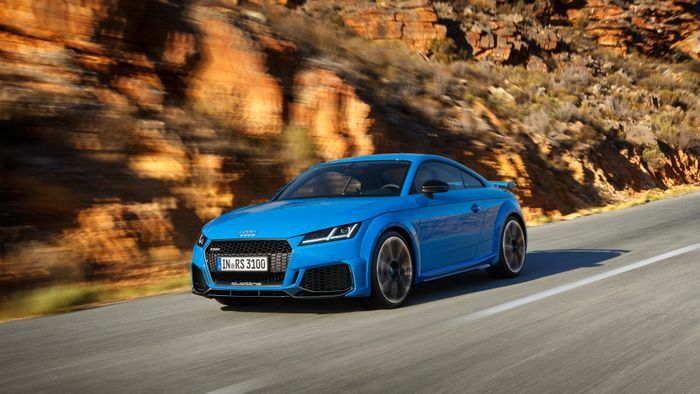 Finally, there are some new colours to choose from, with Kyalami green (exclusive to the RS), Pulse orange and Turbo blue bringing the total number of available hues to eight. 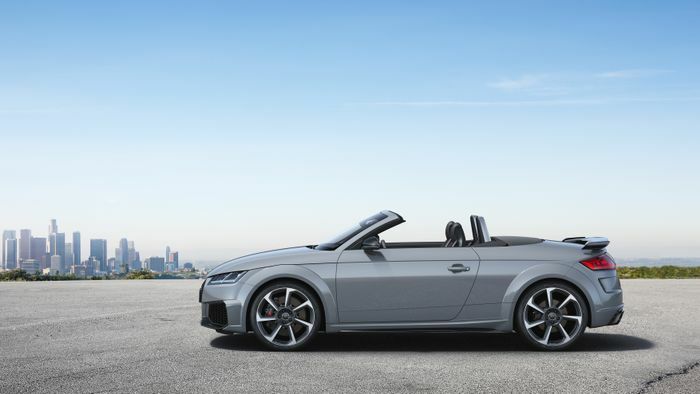 The new-ish Audi TT RS goes on sale on 7 February in Germany with a starting price of €67,700 for the coupe and €70,500 for the Roadster. UK pricing will be released in the coming weeks.